An international team of researchers has conducted tests to determine if electromagnetic waves from electric vehicles or charging stations might cause problems for people who have cardiac implantable electronic devices (CIEDs). In their paper published in Annals of Internal Medicine, the group describes their study and results. As electric cars and trucks become more popular, more research is being done to better understand their impact on users. In this new effort, the researchers wondered if electromagnetic waves generated by vehicles powered by electricity rather than gasoline might put certain people at risk—namely, those who have pacemakers or cardioverter defibrillators implanted in their chests. Both use electric signals, one to monitor the heart, the other to jolt the heart if it stops beating. To find out, the researchers conducted a two-pronged test. 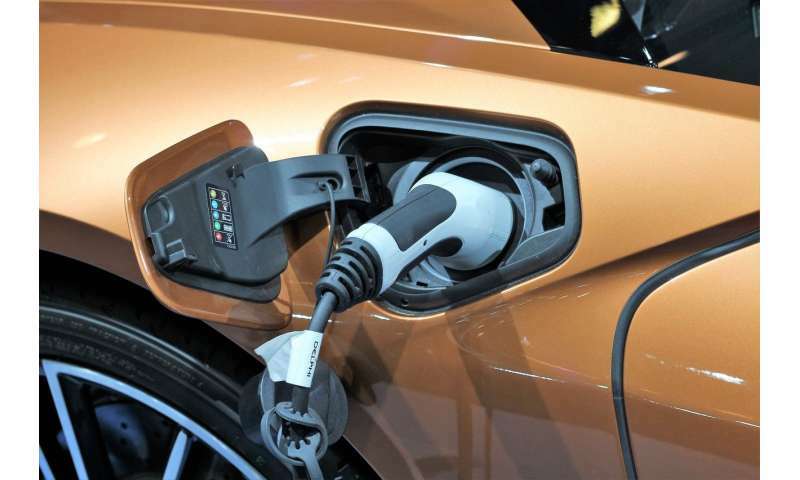 The first involved 108 subjects with CIEDs who sat in an electric vehicle and who approached a charging station as a vehicle was being recharged. CIEDs keep a record of their activity, which doctors use to monitor patient health and to make adjustment to devices if need be. In this case, the doctors studied data from the CIEDs during the time when the volunteers were tested. The researchers also used multiple types of electric cars (Nissan Leaf, BMW i3, Volkswagen e-up and Tesla Model 85S). In studying the results of analysis by the physicians, the researchers report no abnormalities, which suggests the patients were not impacted by the electric vehicles. In the second part of the test, the researchers measured electromagnetic radiation exposure during electric vehicle use. They report that as expected, electromagnetic wave strength is strongest when standing next to the cable charging the car. They report that levels were much lower inside the car, likely due to shielding installed by manufacturers. They note also that there was no measurable difference in levels between sitting in the front or rear seats. The researchers suggest that driving or riding in electric vehicles should be safe for people with CIEDs, but note that their study was small and that both car and CIED technology change over time, so caution is advised. Background: Cardiac implantable electronic devices (CIEDs) are considered standard care for bradycardia, tachycardia, and heart failure. Electromagnetic interference (EMI) can disrupt normal function of these devices and may cause pacing inhibition, inappropriate shock delivery, or device reprogramming. Electric cars represent a potential source of EMI. However, data are insufficient to determine their safety or whether their use should be restricted in patients with CIEDs. Objective: To assess whether electric cars cause EMI and subsequent CIED dysfunction. Methods and Findings: We approached 150 consecutive patients with CIEDs seen in our electrophysiology clinic for routine follow-up between May 2014 and January 2015; 40 patients declined to participate, and 2 withdrew consent. Exclusion criterion were suspected lead malfunction or CIED battery life less than 3 months. After we obtained informed consent, CIED programming was optimized to detect EMI according to established protocols (1). Participants were assigned to 1 of 4 electric cars with the largest European market share. To ensure electric operation only and maximum electromagnetic field generation, we excluded hybrid vehicles. Car assignment was determined by vehicle availability when participants visited the test facility. I wonder why they did this study. Manufacturers have to do EM tests, anyhow, before getting a product out to the public. The results of these tests should be readily available. If the EM field strengths are below that which is mandated by law people with CIEDs should be good.